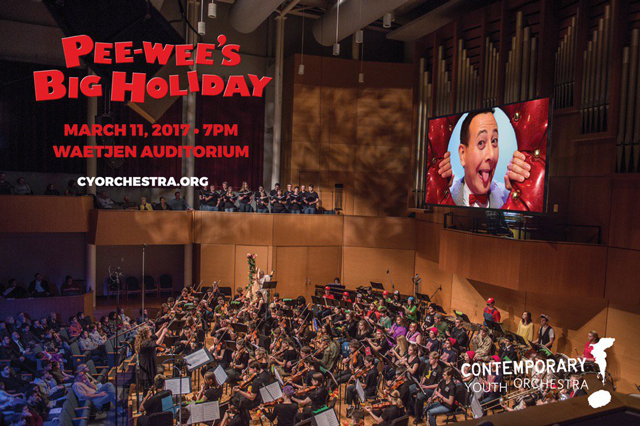 Young people from Cleveland, Ohio’s Contemporary Youth Orchestra (CYO) will be performing the music from my latest film, Pee-wee’s Big Holiday, LIVE!! This Saturday, March 11th, this group of talented high schoolers will play the soundtrack accompanied by a screening of the film at Cleveland State University! CYO’s music director Liza Grossman says, “It’s fun, it’s light, it’s circus-y and the music is very reflective of what’s happening in the film.” She’s right! If you can’t make the show in person, be sure to pick up the soundtrack on CD or VINYL PICTURE DISC! *If you’re a longtime fan of mine, you probably remember that he also created music for my TV show, Pee-wee’s Playhouse! That’s wonderful. Though, I won’t be able to make it. Let me congratulate, Pee-wee … This is great news! The more often this music sounds, the more will spread around the good mood and amazing, magical atmosphere that accompanies the whole film. Mark Mothersbaugh’s work absolutely wonderful!